Eli Yoggev grew up in Philadelphia before moving to Israel in 1997. In Israel he attended Yeshivat Machon Meir, Mercaz HaRav Kook, Yeshivat Har Etzion, and the Bar-Ilan University Kollel. His academic career led him from Herzog College in Alon Shvut, where he received his B.Ed. in Jewish Philosophy and Biblical Studies, to Bar Ilan University in Ramat Gan, where he completed his master’s degree in Jewish Philosophy. He has recently submitted his doctoral dissertation to Bar Ilan University on the worldview of Rabbi Mordekhai Leiner of Izbica and his close circle (Hassidut Izbica-Radzin). Eli has been involved in Jewish education for over a decade, teaching at institutions such as Yeshivat Darkaynu (Alon Shvut, Israel) and the Jewish Community High School of Gratz College (Melrose Park, PA). 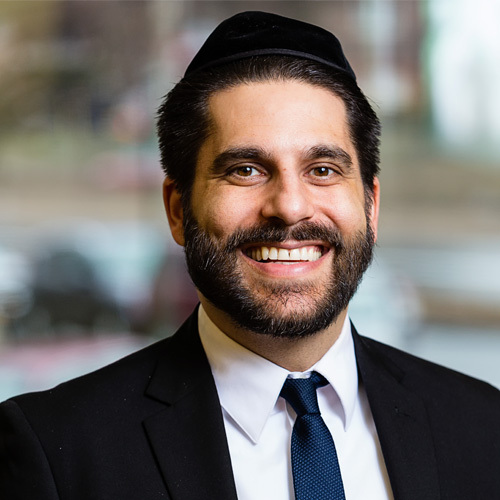 Eli’s rabbinic aspirations include leading an inclusive congregation, bridging gaps within the broader Jewish community, and working in unison with other faith traditions for the betterment of our global society.